Locally manufactured Infantry Patrol Vehicle. 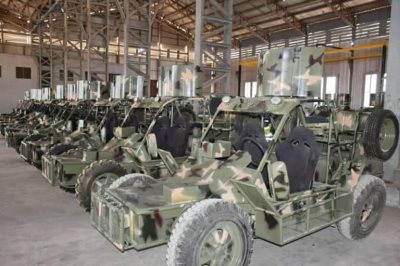 AFRICANGLOBE – The Nigerian Army is domestically manufacturing a light military patrol vehicle at a new facility that was recently launched by the head of the Army. The Nigerian Army released photos showing ten vehicles identical to the Infantry Patrol Vehicle (IPV) unveiled during the first Nigerian Army Research and Innovation Summit held in Abuja in February 2017. The IPV was displayed armed with 12.7 mm DsHK and 7.62 mm FN MAG machine guns and reportedly weighs 650 kg. Photos from the NAVMC launch show the vehicles fitted with turrets but not weapons. Also on display at the launch were Toyota vehicles fitted with turrets – apparently 35 Toyota Buffalo vehicles were inaugurated by Buratai. “I am exceedingly pleased to acknowledge that within six weeks of its existence, the Company has met my mandate by refurbishing a total of 35 Toyota Buffalo Vehicles, eight AFVs of various variants, 10 assorted heavy duty generators and over 10 different TCVs, water tankers and mobile workshops,” Buratai said. “The Armoured Fighting Vehicles and other tactical and logistics vehicles commissioned today will be deployed to support ongoing operations in the North East and other parts of Nigeria,” he said. “Today marked an indelible milestone in the history of the Nigerian Army’s march towards self-reliance in the production and maintenance of armoured fighting vehicles and other classes of vehicles as over the years the Nigerian Army has relied on importation of such vehicles, thereby spending huge foreign exchange which in turn depletes capital allocations”, said the Managing Director/Chief Executive Officer of NAVMC, Major General VO Ezugwu. Ezugwu added that the company has produced 50 light combat vehicles in the last two months. During the launch last week, Buratai said that the Nigerian Army will start exporting combat vehicles to other African countries around 2030 after meeting Nigerian Army requirements around 2025. To promote indigenous contractors and the local content policy of the Federal Government, the military vehicle manufacturing company will partner with some companies like ASD Motors Nigeria Ltd, Venture Force Limited, Innoson Motors, Machine Tool Company Osogbo and Peugeot Automobile Kaduna. Meanwhile, in January last year Nigerian vehicle manufacturer Innoson signed an agreement to produce armoured vehicles for the Nigerian Army, with 100 to be supplied immediately. Apparently at least 40 vehicles have been delivered. In January 2018, Innoson handed over three newly built vehicles for Nigerian Army trials – these vehicles were the IVM G80 Bigger Jeep, IVM G40 Smaller Jeep and IVM Granite Pickup. Innoson previously delivered an unspecified number of G12 4×4 utility vehicles to the Nigerian Army, which were handed over in November 2016. The Nigerian military has acquired armoured vehicles from other domestic manufacturers – for instance it has ordered Ara (Thunder) armoured personnel carriers from Proforce, with production done by Profoce in conjunction with the Defence Industries Corporation of Nigeria (DICON).